This is an amazing chicken burger, my wife made it for dinner tonight, blue cheese, hot sauce and chicken.. You can't go wrong! 1. Preheat non-stick pan, combine Greek yogurt, blue cheese, lemon juice, pinch of pepper and salt, stir and set aside. 2. Season the 4 chicken breasts with chili powder, salt and pepper and then put the chicken on the pan to cook for 6 minutes per side. 3. Add the sliced onions to the pan as well and grill. Continue cooking the chicken another 5 minutes then move it to a plate as well as the grilled onions. 4. Mix (melted) margarine and hot sauce and brush all over the chicken, put a leaf of romaine lettuce on each of the buns and add a chicken breast on top as well as blue cheese sauce. Top with grilled onions and the other half of the bun, ENJOY! Please Note: 16oz chicken breasts = 4 x 4oz Chicken Breasts. 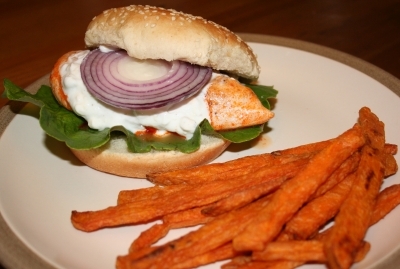 Also, I did not include the sweet potato fries in the recipe/nutritional analysis.